" Articles in Category: Chris Murphy	"
It was not 72 hours following US Special Counsel Robert Mueller's indictment on Friday of 12 top Russian Military Intelligence officers on 11 felony indictments related to hacking into and stealing DNC and Hillary Clinton campaign emails and releasing them to the world, in an alleged attempt to manipulate the 2016 Presidential election, when Trump tweeted: "Our relationship with Russia has NEVER been worse thanks to many years of U.S. foolishness and stupidity and now, the Rigged Witch Hunt!" Hours later he held his one-on-one summit with Putin in Helsinki before going on to hold a remarkable press conference in which, essentially, the President of the United States took Russia's side in the matter on virtually every point. In the bargain, he also attacked the FBI, the DNC and other Americans, as he stood next to the Russian President, taking his side against his own intelligence agencies. On one point, however, they differed. Trump asserted Putin had told him he was not involved in interference in the 2016 Presidential election and he didn't "see any reason why" he would have been. 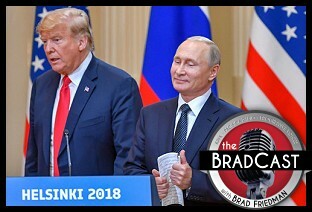 But, when asked directly by a reporter if he "direct[ed] any...officials" to help Trump, who he says he supported over Clinton, Putin admitted, "Yes, I did." 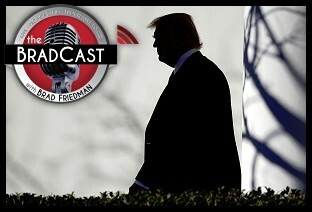 Nonetheless, Trump failed to demand an explanation for any of the exceedingly detailed allegations contained in Mueller's Friday indictments when directly asked by media, choosing instead to return to strange, and largely disproven assertions regarding Democrats, the DNC server, Hillary Clinton's emails, his claims of "no collusion" with Russia and his great electoral college victory (which he also lied about.) Neither did he condemn Russia or its President in any way. We have clips from several of those answers during today's presser and reaction to it --- much of it gobsmacked --- from media, Democrats, former top intelligence officials, and even a number of Republicans, including at least one Fox "News" host who, on air, just after the news conference, condemned Trump's behavior as "disgusting". We have many more new details today about the alleged shooter, a 19-year old former student who is said to have legally purchased the semi-automatic AR-15 military-style assault weapon and arsenal of ammo and magazines to go with it. (A photo of his collection, reportedly from one of his Instagram pages, is above.) State law enforcement officials reportedly say, late today, that the previously expelled and recently orphaned student, Nikolas Cruz, has now confessed to the mass shooting. The predictable fight between gun safety proponents and those opposed to any such measures got underway in full today, as Republicans from President Donald Trump to Florida Gov. Rick Scott to U.S. Senator Marco Rubio went out of their way to avoid discussion of guns and deflect from the need to take action on the nation's continuing gun violence epidemic. They chose instead to declare the need for mental health reform as the only way to prevent the "true evil" behind such massacres, while spreading some of the blame to victims who, they claim, failed to alert authorities to earlier concerns about the shooter. 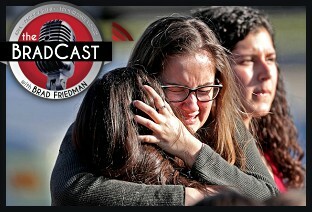 By way of contrast to the uniform GOP denial and misdirection, Broward County School District Superintendent Robert Runcie offered a plea on behalf of Stoneman Douglas High School students who are demanding real action in response to gun violence in the wake of their Valentine's Day nightmare. "I hope we can get it done in this generation," he said at a news conference today, flanked by two of the National Rifle Association's top benefactors in Florida, Gov. Scott and Attorney General Pam Bondi. "But if we don't, they will," he vowed. We're joined to discuss all of the above, including the stranglehold that the terror-enabling NRA continues to have over Republicans from D.C. all the way to state and local governments, by WENDY WHEATCROFT, Group Leader of the San Diego Chapter of Moms Demand Action on Gun Sense. Wheatcroft, a former elementary school teacher, explains that she has lived through active shooter lockdowns herself, and charges that "the NRA has been infiltrating local government for years. Not just local government offices, but school boards, water boards, every lower level of government. 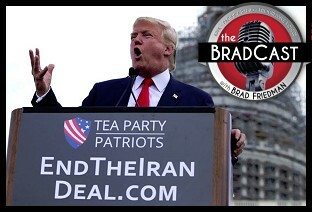 They have been infiltrating and pushing out these talking points." She details her own group's efforts to enact common sense gun reform, such as "red flag" laws that were adopted in California, to enable "family members or police to remove weapons from someone they deem to be a threat to themselves or others." "There is no such thing as 'too soon' to talk about gun violence," Wheatcroft argues. 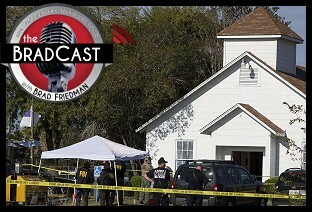 "These shootings are compounding, one upon the other upon the other, so when is the time? It's too late for those families --- it's too late for those moms whose kids did not come home from school on Valentine's Day. Can you imagine?," she asks tearfully. She also speaks to how gun safety proponents can take on the NRA (who "will say and do anything possible to sell their guns and make money"), and cites removing NRA-supported elected officials from office as the most effective weapon for doing that. "It's just so important for us, in every city, to buckle down locally and to make sure that we are supporting candidates who do not share this narrative and this message." "Right now, our House is dominated by legislators who have been bought by the NRA," Wheatcroft says. "Gun Sense candidates aren't just Dems. It's not enough to just be a Dem anymore. We need people who are champions for gun violence prevention, and who will outspoken and unafraid to speak out and stand up to the NRA." "We are not trying to take anyone's guns away. We are not here to ban the 2nd Amendment. We are here to help put in place gun safety measures that enable gun owners to maintain their rights, and to keep their guns, while also keeping people safe from guns." We start today with the encouraging news for Democrats, as a 26-year old lesbian candidate for state Senate in deep "red" Oklahoma has unseated yet another Republican in a special election this week. It's the third time a state Senate seat has been flipped by Dems in OK since a 24-year old woman became the youngest chair of a state Democratic Party last year. Speaking of trouble for Republicans, we've also got the latest on the Roy Moore mess in Alabama, as President Trump, also accused of sexual assault by multiple women before his own election last year, has frustrated fellow Republicans by failing to speak out in the matter, following bombshell allegations that Moore assaulted a number of teenagers, as young as 14 years old, while serving as a 32-year old prosecutor. But Moore and his supporters are fighting back today, as is his wildly embarassing attorney. A robocall falsely claiming to be from a reporter at the Washington Post (which originally broke the initial allegations against Moore last week) has reportedly been circulating in Alabama, in advance of the December 12 election, claiming to be offering money in exchange for new allegations against the far Rightwing GOP nominee for US Senate. And, far Rightwing radio propagandist Rush Limbaugh has come up with a very novel defense for the accused GOP child molester at the same time. Also today, more news on the mass shooting at and near an elementary school in Northern California that killed 5 and wounded 10 others on Tuesday. Many new questions have surfaced about why the shooter, a local man with a criminal record and anger management issues, was able to purchase and then retain semi-automatic weapons even after recent encounters with police including domestic violence complaints and being charged with stabbing a neighbor. But, at least the mass killer wasn't Muslim, so NRA-bribed Republicans can begin ignoring yet another domestic mass shooting immediately. Then, as concerns continue to grow worldwide over Donald Trump's saber rattling with North Korea and his access to nuclear weapons, the U.S. Senate held a hearing this week to discuss Presidential authority to wage war and launch nuclear weapons without anyone having the ability to prevent him from doing so, if he chooses. 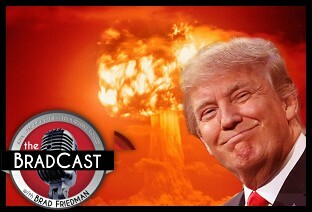 Longtime nuclear weapons policy analyst STEPHEN SCHWARTZ of the Middlebury Institute of International Studies joins us to discuss what, if anything, was accomplished at the Senate hearing, the first on the topic since 1976, and what, if anything, can (or should) be done to restore a more sane use-of-nukes policy in the only nuclear-armed nation in the world which rests sole decision-making power on whether to use such weapons with one single person. That person, currently being Donald J. Trump, has raised many worries from Democrats and Republicans in Congress alike. Whether they're willing or able to do anything about it, however, is a different matter, as we also discuss today. "The reality of the situation is that you're putting enormous power in the hands of one person," Schwartz, tells me, detailing how, short of "mass insubordination" by military leadership, even they would be unable to prevent such an event if Trump ordered it. And, he explains, even objections on legal or Constitutional grounds by military leadership might be insufficient to prevent disaster in the "at most 15 minutes, perhaps, as little as five or ten" during which a President would have to make a decision about how to respond in the event of an apparent incoming attack. Following the massacre at the LGBT nightclub in Orlando in which more than 100 were shot and 49 killed, the media (including us!) have been reporting the incident as 'the worst mass shooting in U.S. history'. But was it really? 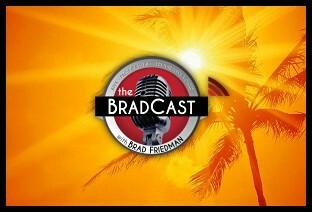 On today's BradCast [audio link to show posted below], I'm joined by Ariela J. Gross, professor of law and history at USC, co-author of several history text books, and the author of What Blood Won't Tell: A History of Race on Trial in America to discuss a number of U.S. mass killings from early in the 20th Century that were, arguably, far 'worse', in that the death toll was much higher. 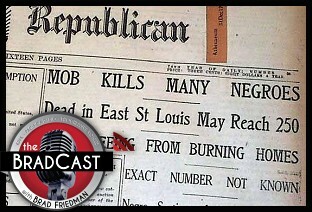 Several of them, including those in East St. Louis, IL and Tulsa, OK, have been largely obscured by history as "race riots" instead of the mass killings they actually were. Some historians, she explains, now use the term "'massacre' because 'race riot' makes it sounds as though there were something two-sided" about these wholesale slaughters of African-Americans. "Some historians refer to them as 'racial cleansing', not unlike the ethnic cleansing that we saw in parts of Eastern Europe in the late 20th Century," Gross tells me. The exact number of deaths in those horrific incidents (not to mention similar slaughters of Native Americans) are still unknown, but are believed to be in the hundreds in a number of cases. Gross notes, however, that had the killers at the time "had access to military-grade weapons the way [the Orlando shooter] did, we'd be talking about thousands of people dead." She also details how "racial terror has gone hand-in-hand with our gun culture" or the years. Also today: Surprise! Attempts to pass gun safety legislation in the U.S. Senate fail again; The latest FEC filings are in, and the Trump Campaign appears to be in big big trouble, at least if fundraising, staffing and cash on hand mean anything to his particular candidacy and what it may mean for the RNC as a whole; And new polls find Hillary Clinton still ahead of Trump, though not by as much as might think, particularly given the presumptive GOP nominee's disastrous past couple of weeks. From a sweltering Los Angeles, on the first official day of Summer, I speak to some of the many claims and allegations that this year's Democratic primary was "stolen" --- either by Hillary Clinton, the DNC, or anybody else. 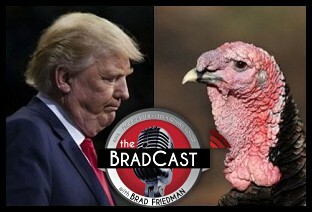 Just a few thoughts on all of this from someone who has investigated and covered issues of Election Integrity and fraud and voter suppression and non-overseeable computer voting systems and tabulators, often in excruciating detail, for more than a decade at The BRAD BLOG, on The BradCast, and anywhere else that would have me. As part of today's epic rant on all of this, I also offer some advice to those who believe California was "stolen", and how state law allows them to actually try and find out...if they really want to. Also today, the Sanders campaign says supporters are answering his call from last week for fresh candidates to step up and run for office with progressive platforms at the local, state and federal level. Meanwhile, the NRA-funded Republicans continue to obstruct any meaningful legislative action to try and help prevent gun violence following last week's massacre in Orlando, as the U.S. Senate blocks attempts to bar suspected terrorists from buying weapons of mass destruction at local gun shops, gun shows and online. All of that is playing out, as Donald Trump, the GOP's presumptive nominee for President, offers a particularly egregious lie in hopes of backpedaling from his repeated statements last week that he would have liked to have seen club patrons with many more guns in that dark, crowded LGBT nightclub in Orlando. It's a position that even the terrorist-enabling NRA no longer seems to fully agree with. First up, the shooting and stabbing death of British Labour Party MP Jo Cox, has stunned the UK, just days before the controversial "Brexit" referendum vote on whether to leave the European Union. The alleged killer is in custody, and reportedly shouted "Britain First", the name of one of the Rightwing groups opposed to staying in the Union, during the attack. Next, the Democrats' 15-hour 'filibuster' in the U.S. Senate, lead by Sen. Chris Murphy (D-CT), comes to end with an apparent victory, of sorts. The Senator --- who served as Newtown, CT's member of Congress when the Sandyhook Massacre resulted in the deaths of 20 school children and 6 adults back in 2012 --- sought to force Republicans to allow votes on closing the gun show/online background check loophole, as well as legislation to disallow suspected terrorists from easily and legally purchasing guns. In related news, President Obama's spoke on Thursday after meeting with family members of the victims of last weekend's Orlando Massacre, and called once again for action to help prevent such tragedies. 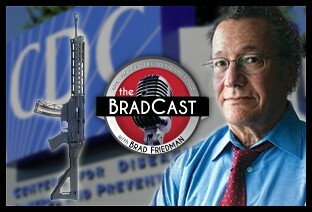 Then, as the American Medical Association (AMA), one of the nation's most powerful lobbying organizations, has finally come out in favor of federal funding for gun research, I speak with Dr. Mark Rosenberg, who headed the Center for Disease Control (CDC)'s National Center for Injury Prevention twenty years ago when, in 1996, he squared off with Republicans in Congress who ultimately forced the federal agency to end all research into gun violence, the causes behind it, and how to help prevent it from happening in the first place. Rosenberg, who recently retired as head of the Task Force on Global Health, explains the history of what is now known as the 'Dickey Amendment', which effectively served to end all federal research on guns. He describes his initial confrontations with then U.S. Rep. Jay Dickey (R-AR), who has since, ironically enough, become a friend and ally, and why still-absent federal research funding is so important to helping curb the nation's extraordinary gun violence epidemic. "The NRA had been attacking us [the CDC] for years, because they thought that to allow research to be done might not be good for gun sales. And so they developed a zero tolerance policy," Rosenberg tells me. "They told their members that it's either-or, black and white, take your choice. Either you can do the research or you can keep your guns. But they said you can't do both. 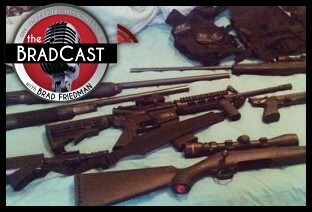 And if you allow the research, we will all lose all of our guns." The showdown with GOPers doing the bidding of the NRA at the time, he says, came not long after CDC-funded research found that "having a gun in the home --- not only did it not protect you, but it increased the risk that someone in your family would be shot and killed with a gun, not by 5 or 6 or 20 percent, not by 80 or 90 percent, but more than 200 percent." Rosenberg explains his fascinating history with former Congressman Dickey, how federal research is not actually "banned" to this day (despite reporting to the contrary), why it is still not carried out nonetheless, and what he describes as the four "basic scientific questions" that federal research could help answer. Namely: "Who gets shot, how many people? "; "What are the causes" of gun death and injury and "what increases and decreases the risk"? ; What could "work to prevent it"? ; and, "once you find things that work, how do you put them into legislation and craft a policy that will both keep us safe and protect the rights of law-abiding gun owners"? It's an eye-opening and important discussion that I hope you'll take some time to listen to and share. And, finally, at the end of the show, as your gift, you'll be rewarded with a much-overdue laugh, courtesy of Al Franken. Enjoy!